JayWalk - All Your Xmms Are Belong To Me: What Is This Yellow Thing? Well, for those who have seen the earlier "What Is This White Thing?" entry , you would have know that this is essentially the same thing except that the earlier white one was regular foam and this was the more expensive Visco Memory Foam. 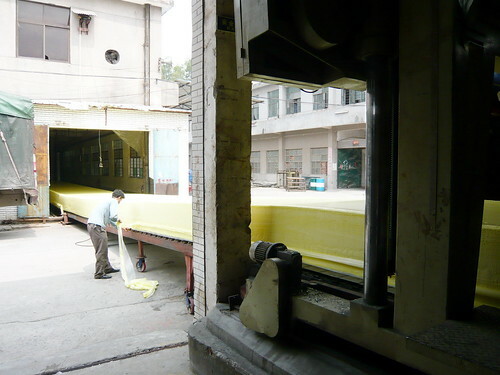 In my earlier entry, I mentioned that the foam producing spans out to 300m at one go. Actually, after further clarification, the correct total length is about 230m, still very much the length of an aircraft carrier albeit a smaller one. What you saw in the earlier entry was merely half the total length as I arrived too late to take picture of it in its entirety before it was cut up. This time round, I had the luck to be at the factory again right at the time they were producing another batch of these. 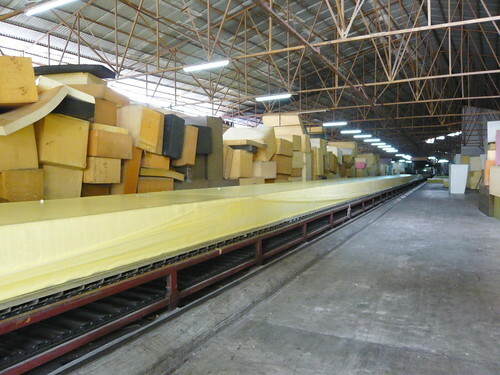 The factory have to construct a "London Bridge" to connect the two factory buildings in order for the foam to travel across. The foam is produce (imagine a Mr Softee ice-cream machine but a mega huge one) on the right side of this picture and as the foam in liquid form is produce, the conveyor belt will pull it away from the "dispenser" to make space for more foam coming out. Gary: If that were real butter, I wonder if I could run then slide the entire 230m? 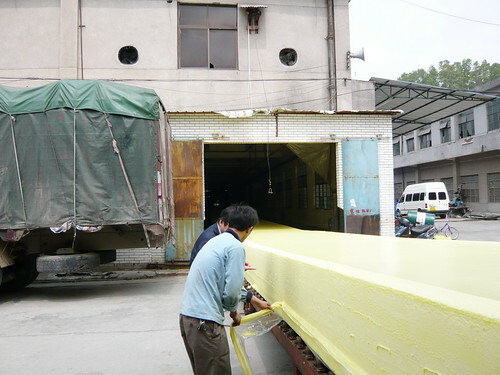 that looks like some gigantic yellow eraser.. haha! Grasshopper: I would like to see you jump onto the foam and see you try to roll. Truth of the matter is that the foam in the picture still need a bit of time before it dries out. You will be stuck to the wet foam when you land. Would be most hilarious if it really happen. I'd be sure to take lotsa photos of you.